On January 3rd, 2019 at 0910 hours, the Norwich Fire and Police Departments were dispatched to 42 Prospect Street, Norwich, Connecticut as a result of multiple E911 calls reporting a working structure fire. First arriving Police and Fire personnel found heavy fire conditions to the rear of the first and second stories of the occupied building. Both apartments of the two family residence were occupied by a total of seven people at the time and all were safely evacuated. Norwich Firefighters brought the fire under control at approximately 10:42 AM and no injuries were reported. The fire caused major damages to the first and second floors of the structure which was deemed uninhabitable by Norwich Building officials. The displaced residents were assisted by members of the Red Cross. 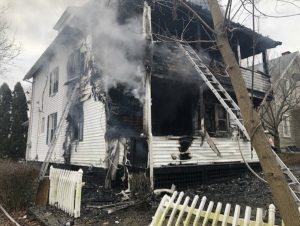 The Norwich Fire Marshal’s Office conducted the origin and cause investigation of the fire along with the assistance of the Norwich Police Department Detective Division and an Accelerant Detection K-9 team from the Connecticut State Police Fire and Explosion Investigation Unit. The Norwich Fire Marshal has ruled the fire incendiary. Anyone with information regarding this fire is urged to contact the Norwich Police Department Detective Division at 860.886.5561 extension 7 or Norwich Deputy Fire Marshal Mark Gilot at 860.887.2780. Citizens may also call the Norwich Police Department’s Anonymous Tip Line at 860.886.5561 extension 4. All information may be kept confidential. The Norwich Police Department continues in collaboration with members of the Fire Marshal’s Offices of the City of Norwich and the State of Connecticut to bring the investigation of all suspected arson cases in the City to a definitive and successful conclusion.